Acanthamoebae keratitis is a serious and devastating ocular problem. 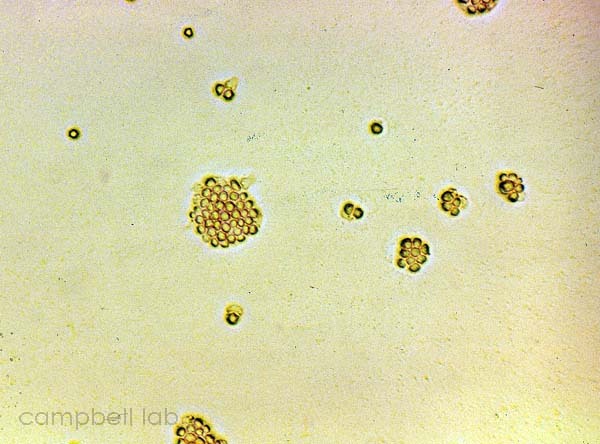 Rapid confirmation of the presence of Acanthamoebae in a patient specimen is essential. The laboratory diagnosis of Acanthamoebae is made through culture, examination of cornea smears on glass slides by giemsa, and PCR. 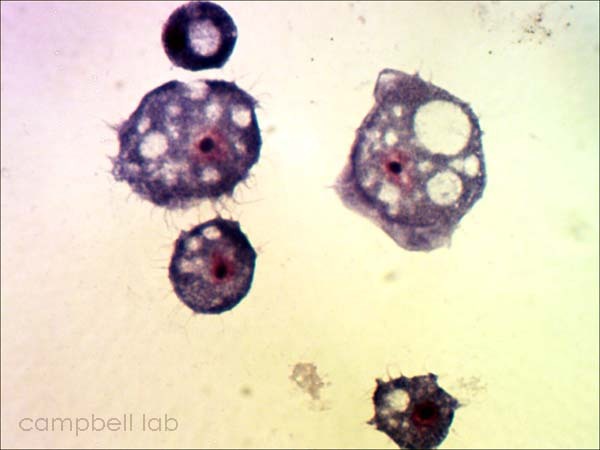 Specimens for acanthamoebae cultures include corneal scrapings or biopsies. Other possible and highly recommended specimens include the patient's contact lenses and contact lens solutions. - Bartels ChlamTrans™ chlamydia transport medium or sterile non-preserved saline for PCR collection. Non-nutrient agar plates are warmed to room temperature prior to inoculation. Corneal scrapings are inoculated directly onto the agar plates and overlayed with a slurry of live Enterobacter aerogenes. The plates are incubated at 30oC and monitored for trophozoites and cysts every other day for 7 days using an inverted light microscope. The non-nutrient agar plates are examined for fronts of trophozoites that appear grossly as a distinct circular arch from the point of agar inoculation. 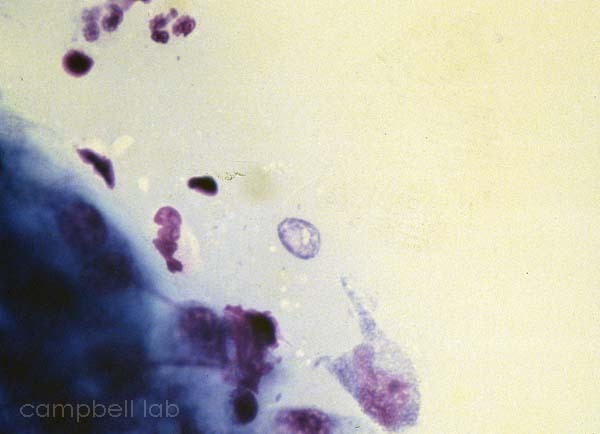 Initially all trophozoites are present but as the circle of the front becomes larger, cysts are present between the front and point of inoculation. Trophozoites appear as acanthopodia that are irregularly shaped with a prominent nucleus. These nuclei may appear to blink when observed under the adverse conditions of light and heat. Cysts appear as smaller, circular, and polygonal with a double wall. To culture a contact lens case, thoroughly rub a swab inside the chambers of the case and then inoculate the agar plate. Contact solutions, saline, and water samples are inoculated onto the agar plate by placing one drop of each sample on a separate agar plate. To culture transport swabs, the swabs should be rolled on the surface of the agar plate. The soft-tipped portion of the swab should be cut and placed on the surface of the media. Add a small amount of bacterial slurry to soft-tipped applicator. Separate acanthamoebae plates should be inoculated if the cornea, contact lens, and solutions will be concurrently cultured. 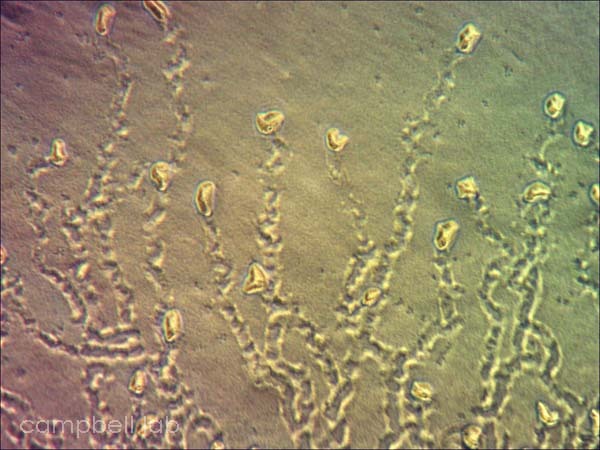 Due to the swarming nature of the acanthamoebae growth, the origin of a sample may be difficult to determine if multiple samples are cultured on a single plate. Corneal material is placed directly on a glass slide. The slides are air-dried, fixed with methanol, and placed in giemsa stain for 45 minutes. The slides are briefly decolorized in 95% ethanol. 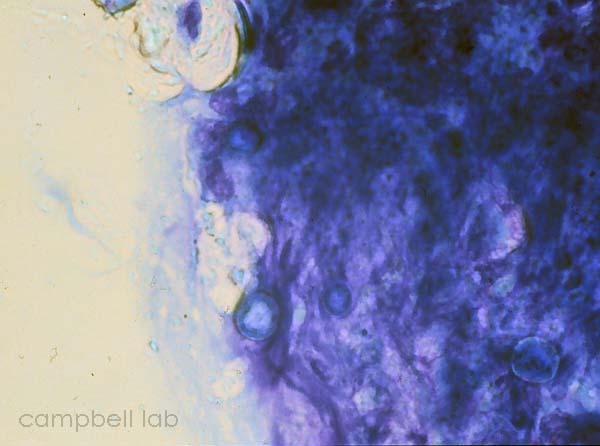 The slides are examined with a light microscope at 100x magnification for acanthamoebae trophozoites and cysts. Corneal specimens are placed in non-preserved media such as Bartels ChlamTrans™ chlamydial transport medium, PBS, or distilled water.